In this May 19, 2010 file photo taken near Kingfisher, Okla., storm chasers and spectator vehicles clog the road and shoulder of Highway 81. Meteorologist Gary England talks with KGOU's Jacob McCleland. “The radars are great, all that stuff is great, but it doesn’t give you the complete picture,” England said. 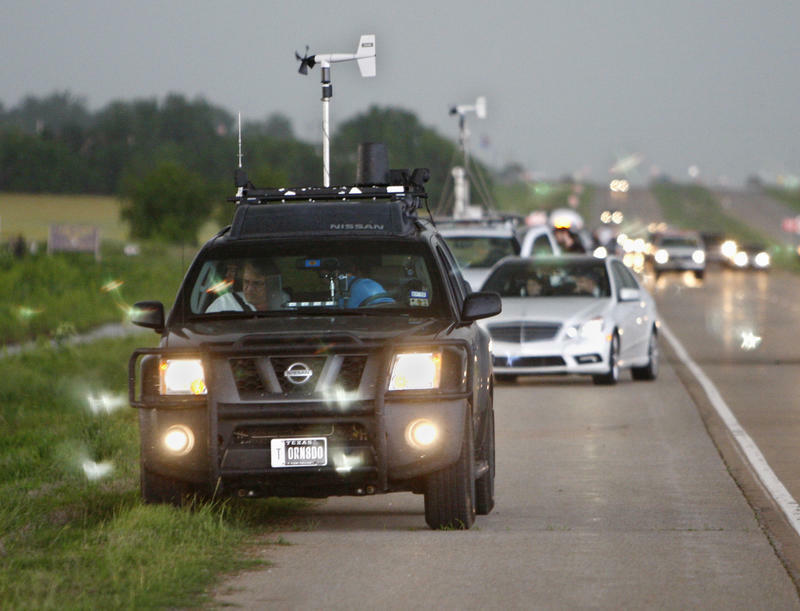 Three storm chasers died last week in west Texas during a storm that brought high winds and hail to the Lone Star State and Oklahoma. Kelley Williamson and Randy Yarnall were working as contractors with the Weather Channel when they died in a head-on collision with a freelance storm chaser, Corbin Jaeger, who was also killed in the crash. England can envision a time when machines like drones and remote cameras will be able to replace storm chasers on the ground for the purpose of documenting storms. However, he doesn’t think chasers will stop pursuing storms. England says he is not aware of another incident in which multiple storm chasers died in a traffic accident during a storm. However, three storm chasers were killed by a 2013 tornado in Canadian County, Oklahoma. “There’s never been a cluster of storm chasers caught by a tornado. It will happen, because there are so many people, and sometimes the storms are quite unpredictable,” England said. Jacob McCleland: Kelley Williamson and Randy Yarnall were working as contractors with the Weather Channel when they died in a head-on collision with a freelance storm chaser, Corbin Jaeger, who was also killed in the crash. Gary, storm chasers by nature have a very dangerous job. Have you heard of anything like this happening before? Gary England: Well not with the dramatic collision, but the Canadian County Tornado in 2013, we had a car, it was rolled and dumped and the tornado caught it. And two very famous and well-known storm chasers were killed in that because a tornado got them. They made a bad decision really. They thought they could outrun it. They didn’t know what the storm was, and nobody did at that particular point. But, also, lost another storm chaser that day, kind of a freelancer. So it does happen. McCleland: Now I have heard a few times that the most dangerous thing about chasing storms isn’t necessarily the storm, but the crowds that can gather, especially in some of these rural areas where the roads may not be the best. You could be out on some county road on a farm somewhere. From your experience, is this something you’ve found to be true? England: Oh yeah, yeah. The most dangerous part about it is in the traffic. I don’t the last time a tornado, just that one time in the car, but tornadoes, they do catch cars, they do throw them up in the air, they do kill the occupants. But there’s never been a cluster of storm trackers caught by a tornado. It will happen, because there are so many people, and sometimes the storms are quite unpredictable. Those guys and gals and pretty wild, let me tell you. McCleland: What are the benefits of having people on the ground to document storms like this? England: The benefits would be, you know, with all the technology and all, we have the radars, all those things, it’s still, you like to have those eyes out there that says, “Yeah, I see a wall cloud. I see strong rotation. I see a funnel. I see a tornado on the ground.” Because the radars are great, all that stuff is great, but it doesn’t give you the complete picture. McCleland: Let me ask you about this. Now we have machines that can kind of be those eyes on the ground. I’m think like drones, for instance. You could dispatch drones to videotape tornadoes from a distance. Do you see a time when perhaps they could almost displace having those human eyes on the ground to document storms? England: Well I could see that for documenting the storms, drones, whatever, remote cameras … that will happen. That time will happen. But it’s not going to stop the storm chasers. It’s in the their genes. They can’t have it. They just can’t handle it. They just have to go. And once you know some of them, they just got to go. It’s in the genes. It’s something they have to do. McCleland: Now you’ve had a long career in meteorology in Oklahoma. Have you ever been a storm chaser? England: A long time ago for about one time. I decided once I got into television and meteorology, I would rather be where I had the cameras in the field, had the storm chasers out there, and had all the electronic equipment, the radars, all those things, I had it all together right there then to going out to western Oklahoma and trying catch a storm. So, I don’t like to do it, and like I said, I did it very briefly, but a lot of people love it, man. McCleland: That one time that you tried it, did anything happen that made you decide you had no interest in doing this again? England: The storm ran off and left me. McCleland: I’ve been talking today with Gary England. Gary, thank you so much. It’s been a pleasure. England: Hey, I’ve enjoyed it. Thank you.